Nano 101: What Is Nano? While its name may refer to something minuscule, Nano cryptocurrency (NANO, formerly known as RaiBlocks) do dream big in their ambition to surpass what even the likes of Bitcoin promised to achieve. Nano aims to become an alternative to both fiat currencies and the dominant cryptos as a means of everyday payments. Such systems are often bogged down by various technological limits, but the organization presents its “cure” in the block-lattice architecture which delivers safe and instantaneous transactions with no price tags attached. Limited scalability. Scalability issue roots in the limited capacity of blocks in the blockchain to store data. It effectively reduces the number of transactions per second the blockchain can handle, particularly with the maturing of the technology and the higher number of users on the platform. Also, a place in a block has effectively turned into a “commodity,” with the average transaction fees on Bitcoin being described as unacceptable for many users. High latency. Existing computational latency with Bitcoin and other cryptos is described as too high and one of the causes of protracted confirmation times. This is another area which Nano seeks to improve. Inefficient power utilization. Since, for instance, Bitcoin’s Proof of Work (PoW) consensus model arguably requires 260KWh per transaction on average, its entire network would need some 27 TWh per year. As an alternative, Nano proposes getting rid of the distributed consensus protocols like PoW or Proof of Stake (PoS) and giving each user his/her own blockchain. It will arguably reduce the competition between the owners of power-hungry computational systems and allow for the use of less demanding ones for the same purpose. All these features combined are supposed to deliver theoretically unlimited scaling to the Nano platform, paired with faster and feeless transactions and reduced power consumption as a bonus for its users. How Does NANO Implement its DAG Technology? Nano developers cite blockchain as the major invention of the Bitcoin platform. Thus, it is no wonder that their attempt to change what they see as lacking with Bitcoin starts with finding an alternative to this technology. Instead of the blockchain we find with numerous cryptos, Nano opts for the structure described as “block-lattice.” Nano’s block-lattice is a variant of the Directed Acyclic Graph (DAG) architecture described as an “alternative” to the blockchain. DAG technology is implemented in many cryptocurrencies including IOTA or Byteball. One of the key differences between the DAG and blockchain is the way in which their data are organized. 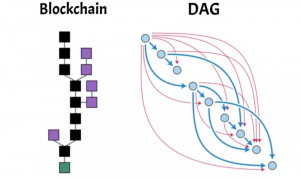 Instead of sequential addition of blocks to the chain, DAG uses its own “topological” ordering in which all its nodes point in the same direction without the possibility of a loop. DAG is best described as having an appearance of a tree or a flow chart, with its folders branching into subfolders which are further divided into smaller units. Nano moves away from the standard implementation of DAG like its competitor IOTA. Its block-lattice structure does not require the “discovery” of two recent transactions using a relevant algorithm. Instead, each transacting user is given his own blockchain controlled by the user’s private keys. The accounts on the Nano network are described as “account-chains.” They correspond to the transaction or balance histories of a particular account. Since the users are the only parties capable of modifying their chains, they can update their blocks independently of the entire network, i.e., in an asynchronous manner. The speed by which these updates are done is what supports Nano’s bid to offer faster transactions and confirmation times than those found with competing cryptocurrencies. Concurrently, this system aims to resolve the problem of block sizes which has been a hotly debated issue in the crypto community. The reason for this is the fact that block size is perceived as a bottleneck in managing increasingly more transactions that come with the wider adoption of the blockchain technology. As an alternative, Nano offers its two-transaction system, with one of the transactions going from a sender and another one to a receiver. The prerequisite for the transaction confirmation is having the receiver sign the block which confirms that the relevant funds have reached their destination. In case only the sender signs the block, the transactions cannot be completed. The focus on asynchronous management of accounts on the Nano network is also reflected in the manner in which the Nano platform plans to introduce future upgrades to its chain and network. Since sending an instruction to implement an upgrade on a specific block is not an option, the Nano team has started implementing the system called Epoch blocks in late 2018. How The Block-Lattice Technology Manages Transactions? Nano’s block-lattice technology is claimed to be unique for the manner in which the transactions with it are managed and recorded. To use the analogy with blockchain, each of its transactions constitutes an independent block, with each transaction replacing the one which precedes it. New blocks on the account-chain keep track of the current balance of the owner’s account and use that information whenever they handle transactions. It means that the system confirms transactions with NANO by comparing the amount on the sending block with the balance it records on the preceding block and marking the difference. 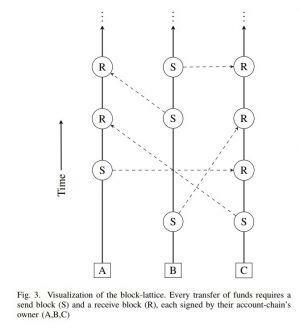 By analogy, the receiving block adds the resulting amount to the preceding block on the user’s account-chain. The balances of both the sender and the receiver are now updated, and the information on it is recorded on a new block. This method allows the block-lattice technology to avoid keeping an entire transactional history on its ledger as the standard distributed ledgers do. With Bitcoin’s blockchain, for instance, the transactions cannot get “green light” before having a full block embedded with the blockchain. In this role, these blocks function as ledgers which hold the whole of the network’s financial records and their history. It drastically increases the demand for information, which slows down the transactions taking place on the network. Instead of this history-based approach, Nano will record the current balance for each account on its ledger only. The network’s account-chains are comparably undemanding pieces of architecture, allowing Nano to tackle the scalability issues with this novel approach. Since keeping evidence of transactions involves only account balances instead of amounts, databases in this process can be easily “pruned,” i.e. have their historical information removed. This allows for the reduction of their sizes at no expense of security. Nano developers brag about being able to process 4.2 million transactions with an unpruned ledger size of 1.7GB. In addition, the system uses the packets running the User Datagram Protocol (UDP) for its transactions, which reduces the costs and demand for the computing resources, with an added ability to make transactions at times when the receiver is not online. Hardware resources needed for the operation of nodes can be kept low as almost all transactions record and rebroadcast blocks only. Block-lattice system is the backbone of Nano’s architecture. Nano network does not need miners or Proof of Work for each transaction as its architecture allows for the dual verification of transactions by both sending and receiving parties in the chain. The absence of mining on the Nano network allows it to do away with the transaction fees altogether. This mechanism powers the Nano’s ambition to win over users who object to current transaction speeds and accompanying fees in some of the other major crypto projects. Besides, Nano wants to set itself apart from them by trying to make the energy spending more efficient. At the heart of Nano network’s security system is the Delegated Proof of Stake model (DPoS). Any conflict relating to a particular transaction is resolved by having Nano delegates vote on the issues. The voting process is carried out in line with the users’ account balances i.e. the amount linked to each node in the network. It means that votes of the users with heftier balances will carry more weight based on the developers’ assumption that they simply have more to lose from dishonest behavior. The non-existence of miners also allows Nano to avoid the centralization of mining power, sometimes considered the weakness of Bitcoin. Nano users are discouraged from attempting to exert undue influence on the network as this can endanger whatever they have invested in it up to that point. Apart from that, the lack of miners allows the Nano network to protect itself from the risk of being exposed to mining-based attacks. This solution does not impact the Nano’s pricing scheme only, as this model plays the central role in Nano’s ambition to offer efficient power management on the network. Unlike Bitcoin, Nano’s block-lattice architecture requires delegates to confirm transactions only in case there is an issue. From this, Nano network’s nodes need less electricity than what would happen if the platform used the PoW model as there is no need for maintaining the maximum and constant hash rate resulting in increased electricity spending. The absence of PoW as a consensus mechanism on the Nano network does not mean it is nowhere to be found. It is implemented as an anti-spam feature which serves to prevent malicious attacks. The feeless pricing structure of the network makes it vulnerable to endless transaction spamming. The implemented PoW system protects Nano by having its wallets pre-cache work for the incoming transaction after one of the transactions has been made. It means there is a five-second amount of work associated with this PoW system, with one microsecond needed for the validation. In this way, a potential attacker would have to invest too much of his computing resources in carrying out an attack, while the regular users need only a fraction of it for making transactions. Speaking of security, Nano was the target of the hacking attack in February 2018, which resulted in the theft of more $170 million worth of NANO from the Bitgrail crypto exchange. The top brass of the exchange actually blamed the Nano developers for the security holes in their technology while suffering accusations for the lack of security on the exchange itself. Some victims who had their tokens stolen demanded Nano to hard fork in a bid to secure the recovery of their assets, but the Nano Foundation responded by establishing a fund to represent its legal interests. The history of Nano starts with its creator Colin LeMahieu, a developer who has worked with Dell and AMD. He began working on the project in 2014. Other prominent team members include Russel Waters, Mica Busch, and Roy Keene. LeMahieu launched Nano in 2015 under the name of RaiBlocks, which was changed to the current one in early 2018 to avoid confusion with its pronunciation. The circulation of Nano tokens is described as the main incentive to run a Nano node on its network. Making this process more secure and faster depends on the health of an entire node-based ecosystem of Nano. It serves as an incentive for businesses and individual users to acquire Nano wallets which also function as individual nodes. There are several official Nano wallets which are made available on the project’s website. They come as web-based wallets, versions for Android and iOS and desktop clients. As of November 2018, Nano’s market cap is valued at $247,049,170. The current value comes off as a drop compared to its all-time high of more than 4 billion USD in early 2018. Nano’s total and circulating supply is 133,248,290 NANO, and no additional tokens will be created. The initial distribution of the tokens was done with the help of the faucet-based system which was closed down in October 2017. Nano can be purchased on crypto exchanges like Binance and HitBTC.